Microsoft Azure : How to connect my Enterprise? Expressroute or VPN? Typical Usage : Almost everything in Azure that isn’t linked by the underneath mentioned services. High Level Solution : A point-to-site VPN also allows you to create a secure connection to your virtual network. In a point-to-site configuration, the connection is configured individually on each client computer that you want to connect to the virtual network. Point-to-site connections do not require a VPN device. They work by using a VPN client that you install on each client computer. The VPN is established by manually starting the connection from the on-premises client computer. You can also configure the VPN client to automatically restart. High Level Solution : A site-to-site VPN allows you to create a secure connection between your on-premises site and your virtual network. 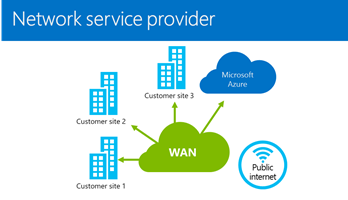 To create a site-to-site connection, a VPN device that is located on your on-premises network is configured to create a secure connection with the Azure Virtual Network Gateway. Once the connection is created, resources on your local network and resources located in your virtual network can communicate directly and securely. Site-to-site connections do not require you to establish a separate connection for each client computer on your local network to access resources in the virtual network. High Level Solution : Azure ExpressRoute lets you create private connections between Azure datacenters and infrastructure that’s on your premises or in a co-location environment. ExpressRoute connections do not go over the public Internet, and offer more reliability, faster speeds, lower latencies and higher security than typical connections over the Internet. 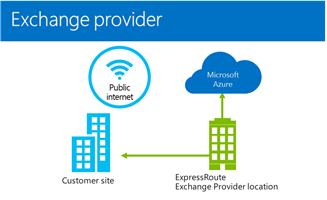 In some cases, using ExpressRoute connections to transfer data between on-premises and Azure can also yield significant cost benefits. 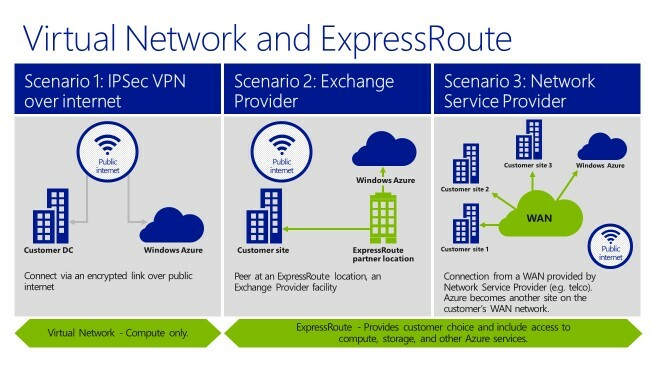 With ExpressRoute Service Provider, you can directly connect to Azure from your existing WAN network (such as a MPLS VPN) provided by a network service provider. So if I get ExpressRoute, how will my network flows go? Basically, the private solutions will ensure that your company communication will not traverse over the public internet. You can configure your service to either use the internet connect of Azure, or your own hop, to breakout towards public services. Let’s say for instance, if you want to download updates, you could set it up that those are done via Azure, instead of going back over your ExpressRoute link in order to break out from within your own premises. So what does this mean for a typical Enterprise? Looking to get do some raw testing?